Saara and Sahil’s love story started out with a strong bond of friendship. But this didn’t last very long! It didn’t take them long to realise that their attachment to one another was definitely more than just platonic. But aren’t couples like this ideal? Friendship plus love. What more do you want! Anyway, the couple got engaged just within a few months of knowing each other and exactly a year later, they got hitched! And their dreamy beach wedding was nothing short of beautiful. Read on to know how this adorable couple celebrated the most important day of their lives! Also, don't miss out on out these fab tips on how to plan your very own picture-perfect beach wedding! 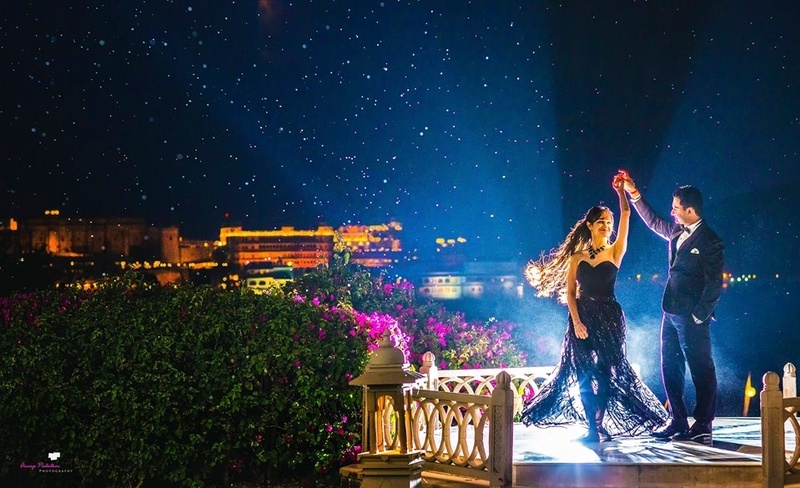 Saara and Sahil started off their wedding celebrations with a pre-wedding shoot that was just beyond exquisite. For the first set of pictures, Saara donned an elegant gown while her Sahil kept it casual in a white shirt and yellow jacket. The second set saw this lovely couple in black formals and the third had them go down the ethnic route, with Saara wearing a colourful saree and Sahil, a forest green sherwani. Each shot was beautifully captured by Anoop Padalkar. Elaborate is an understatement for this Saara’s mehndi ceremony! Thanks to th event planners at Enjay Events, the venue was beautifully decorated in pink, yellow and orange hues. Flower strings, vibrant drapes, suspended sheer umbrellas and fun props were just a part of all the extravagant décor. Saara herself chose to match her outfit with the theme, wearing a stunning orange and pink lehenga with heavy gold work and jewellery that complimented her outfit. Sahil decided to balance out his bride-to-be’s rich outfit and opted for a simple and classic ensemble with minimal gold details. Amongst all the celebrations, they even had a casual, pool party! Well, this couple certainly knows how to have fun. This couple does it again, with their amazing décor! Look out for the pretty paper lanterns that lit up the night, along with crystal and flower strings that hung from the ceiling. The message notes that were attached to the flowers added a nice touch. The stunning couple colour co-ordinated for the evening by wearing shades of navy and sea blue. Beach wedding venues are simply breath-taking. The wedding that took place at The Lalit Golf and Spa Resort at Goa was a sight to behold. Our gorgeous Saara looked every bit bride-worthy in an elaborate red lehenga with intricate and heavy gold embroidery. She topped it off with stunning gold jewellery. The dapper groom decided to match all the grandeur of Saara’s outfit by wearing a royal gold sherwani with a red dupatta. The beachy vibes of the venue lent a laid-back mood to the event!